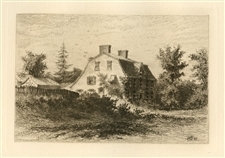 Edmund Henry Garrett original etching "Home of Nathaniel Hawthorne"
Medium: original etching. This impression was published in Boston in 1887 by Estes and Lauriat for the "Nature and Art" portfolio and is printed on cream laid paper. Size: 4 3/4 x 6 7/8 inches (plate). Signed in the plate (not by hand). Edmund Henry Garrett original etching "The Wayside Inn"
Medium: original etching. This impression was published in Boston in 1887 by Estes and Lauriat for the "Nature and Art" portfolio and is printed on cream laid paper. Size: 4 5/8 x 6 3/4 inches (plate). Signed by Edmund Henry Garrett in the plate (not by hand). Condition: there is a stain in the margin (near the edge of the sheet, well outside the platemark and not affecting the image).